Most families want their senior loved ones to remain at home and age in place, but this can be difficult to do for many reasons. Your schedule could be full of personal and professional commitments, or your elderly loved one may live too far away. With in-home care, your loved one can stay in the comfort of his or her home while receiving high-quality care. Here is a closer look at some of the benefits of in-home care for seniors. Seniors who continue to live in their homes, surrounded by their personal belongings and close friends, are more likely to live longer and healthier lives. While receiving in-home care, your loved one can continue sleeping in his or her bed, cooking in his or her kitchen, tending to his or her personal garden, and doing many of the activities he or she loves from the comfort of home. Loss of independence is one of the contributing factors to cognitive decline. By opting for in-home care, you give your loved one the ability to maintain control of various aspects of his or her life. Your loved one can continue to live by his or her own schedule, receiving help from a professional caregiver when necessary. In-home caregivers encourage and motivate seniors to do as many activities on their own as possible. This is the type of independence that can enhance a senior’s quality of life. Isolation is an issue many seniors experience, due to lack of mobility and age-related illnesses. For example, your loved one may be embarrassed to be around other people because his or her hearing and memory are starting to decrease. However, an in-home caregiver can provide companionship to your loved one, making sure he or she receives plenty of social interaction. Companionship can help seniors alleviate stress and prevent depression, obesity, and other serious health issues. For families living in Huntington, WV, respite care can be a wonderful solution when their aging loved ones need companionship and socialization a few hours a week or just need minor assistance with daily household tasks. At Home Care Assistance, we thrive on helping seniors maintain their independence while living in the comfort of home. Opting for in-home care allows seniors to be the primary focus of their caregivers. Your loved one can receive care tailored to his or her needs. An in-home caregiver makes sure your loved one is always the main focus, which could prevent accidents and injuries. Your loved one’s needs can be handled quickly since the caregiver doesn’t have to assist multiple people. When seniors recover in a hospital, nursing home, or rehabilitation facility, they are exposed to more germs that could cause their health to worsen. With in-home care, your loved one has a greater chance of successfully recovering from an illness or surgical procedure, which decreases the odds of a readmission. Seniors generally do well with recovery from their own homes because of the familiarity, personalized care, and privacy. Your loved one can move throughout his or her home with more confidence and peace of mind knowing a caregiver is in the next room. This could motivate your loved one to be more active instead of shying away from exercising or participating in physical activities. Family members can also gain peace of mind knowing their loved one’s professional caregiver is inside the home helping with daily activities such as bathing, dressing, cooking, and cleaning. Some seniors only require help with a few daily tasks so they can maintain their independence. However, those living with serious illnesses may need more extensive assistance. Luckily, there is professional live-in care Huntington, WV, seniors can rely on. 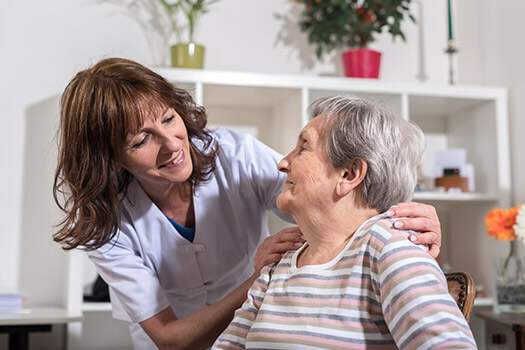 Home can be a safer and more comfortable place for your loved one to live with the help of an expertly trained and dedicated live-in caregiver. If you’re looking for a comprehensive in-home care plan for your elderly loved one, contact Home Care Assistance at (304) 521-2909 today.